The darkness before Creation is very enigmatic in light of the beautiful Creation. Why is Earth surrounded by pock-marked celestial bodies and asteroids? The darkness before creation in Genesis 1 has not been present on Earth during human existence. It is interesting to note the paradox that although outer space is a hostile environment, particularly for man, it is at the same time a methodical environment. Yes, there are major planetary upheavals as we saw in Chapters 1 and 2 of Inventory of the Universe. Yes, during human history, meteorites hit earth from time to time causing minor consequences, but generally when a comet comes ‘close’ to the earth, it is still 100 million miles away! There is still a little breathing space. From our pock-marked, meteor-impacted moon to Mars, there was a period of intense asteroid activity. But, not on Earth. With this relatively orderly march of events how do we explain another great enigma of our time: The meteor-impact craters strewn across the lunar surface and all the other solid planets (Venus, Mercury and Mars) in our galaxy. True, I have no proof of what I’m advancing here as to the real cause of this devastation, I just draw it to your attention. Is it related to the darkness before creation? It is one of the pieces in the Universe puzzle that needs an explanation. These stellar shatterings are in stark contrast to the luxuriousness and craterless surface of earth. Along this line, you’ve heard of the asteroid belt that follows a planetary course around the sun between Mars and Jupiter, thousands of ‘rocks’ the largest of which is 980 kilometers in diameter. Scientists, with their mathematical calculations can pinpoint the location of a planet’s orbit around the sun even before discovering the actual orb. In August 1846 the French mathematician Le Verrier established the existence of Neptune by calculation; the German astronomer Galle first saw this eighth planet in his telescope at the exact location indicated by Leverrier in September of the same year. The Asteroid belt, maybe a destroyed planet … so close to Earth … so mysterious. I mention this because it can be calculated that there is place for a planet between Mars and Jupiter, and indeed Ceres, the largest of the ‘rocks’ in the asteroid belt, being spherical, is considered a dwarf planet. Galacti realizes the author is furnishing this information not as proof of anything, but simply for reflection. Isn’t it interesting that in a stable 8 planet system we have 7 pock-marked or gaseous monstrosities (Jupiter, Saturn, Neptune, Uranus). In between the 4th (solid) and 5th Jupiter (gaseous) planets there’s a belt of debris (obviously solid) where a ninth planet could’ve been. In total contrast, amongst this scene of demolition and devastation is, perched in 3rd position, a planet named Earth, a marvel of fresh air, water and greenery, in one word: life. I have to ask the question, what caused this state of waste and chaos? Is it related to the darkness before creation? Is beautiful Earth, in the midst of this devastation another of Stephen Hawking’s perfect imperfections? By now, as a reader you all know where I’m coming from. So, consider this: That this debris, this darkness before creation, from an exploded planet, now the asteroid belt between Mars and Jupiter is the evidence of the tohu and bohu in Genesis 1.1. This devastation of meteor-impact craters and fragments, just a short distance (in spatial terms) from Earth is the result of angelic rebellion and stellar warfare, star wars before Star Wars. Immediately following the description of the decrepit state of the earth in Genesis 1:2 we see another short phrase: …darkness was upon the face of the deep. We have a cursory knowledge of the meaning of the words darkness (2822) and deep (8415)… so we don’t give it much more attention than that. KJV – dark(-ness), night, obscurity. When a wonderfully and powerfully created spirit being went awry and used its preeminence and supremacy negatively, in its own interest, rather than for the benefit of the entourage, these gloomy and ominous results to the environs are not surprising. In fact this is to be expected. Definitely unfortunate, but to be expected. What happens when one follows the pathway of respect into contempt, light into darkness, wisdom into ignorance? ‘Whoso curses his father (this is what Lucifer–the son of God–did to its Creator) or his mother, his lamp shall be put out in obscure darkness (2822)’ (Proverbs 20:20). ‘Who leave the paths of uprightness (remember, Lucifer was blameless… until wickedness was found in him Ezekiel 28.15) to walk in the ways of darkness (2822)’ (Prov 2:13). God will only allow this contempt and rebellion to go so far. If an individual, of its own volition wants to walk in darkness, that one will end up in darkness. This is the exact situation we find here with the darkness before creation. ‘Such as sit in darkness (2822) and in the shadow of death, being bound in affliction and iron; Because they rebelled against the words of God, and condemned the counsel of the most High: Therefore he brought down their heart with labour; they fell down, and there was none to help’ (Psalms 107:10-12). Yes, at a given point in the downward slide, God does intervene and puts a stop to defiance and resistance. ‘But with an overrunning flood he [God] will make an utter end of the place thereof, and darkness (2822) shall pursue his enemies (Nahum 1:8). Isn’t this a description of the state of the earth as described in Genesis 1:2? Yes it is, and shows the tohu and bohu that results from dissension. Deep, as you now can easily understand also carries a meaning beyond simple physical depth. KJV – deep (place), depth. KJV – destroy, move, make a noise, put, ring again. KJV – break, consume, crush, destroy, discomfit, trouble, vex. From the above Strong’s references you can see the meaning of deep (8415) from 1949 compared to 2000. Even without being able to read Hebrew you can compare the letters and see the connection. As an aside I’ll point out a related difference here, tohu (תֹּהוּ) is 8414 and although it’s not directly related to the very next alphabetically word: 8415 (תְּהוֹם – tehom) poetically these similar words in the same verse ring a bell, Tohu: without form and waste associated with Tehom: deep, destroy and discomfit. Exodus 15.5 reveals this figurative commotion aspect of deep: ‘The depths (8415) have covered them [referring to enemies]: they sank into the bottom as a stone’. Is the use of this hyperbole an exaggeration? Is there a biblical example of going from the highest height to the lowest depths? Here is the longest free-fall from glory to the grave–the depth of the pit–this is figurative of the lowest place you can go, ‘How you have fallen from heaven, O morning star, son of the dawn, you have been cast down to the earth…’ (Isaiah 14:12). The spiritual decline, descent into hell, is accompanied by a literal precipitation out of heaven, of the holy mountain to another abode, of all places, Earth… which, in these opening verses of the Bible, is in shambles. Galacti is more perplexed than ever. Why was the deposed Lucifer hurled down to Earth? We’ve already seen the Serpent, one of its new titles when it forfeited its original name, in the Garden of Eden on earth. Why did God throw it out of His heavenly Garden but allowed it access to the earthly Garden? For the Biblical Hebrew words: Darkness and deep in Genesis revise this fourth key to master Biblical Hebrew which is the literal-figurative meaning of Biblical Hebrew words.We’re going to see time and again our 7 Keys to Master Biblical Hebrew. You might want to put the link in your favorites so you can consult it as necessary. If you read such words as darkness, deep, light, even words like beginning, created, heaven, in the context of darkness before creation in Genesis 1.1-2, ONLY keeping in mind your native language meanings, you are missing the essential meaning. We have a cursory knowledge of the meaning of the words darkness (2822) and deep (8415)… so we don’t give it much more attention than that. 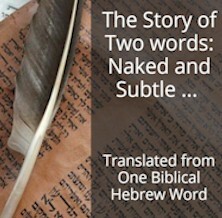 A basic understanding of the usage of Biblical Hebrew is essential as we are seeing. Please notice that all Strong’s and Kneller are doing is showing you how these same words (darkness, deep, light, beginning, created, heaven…) are being used in other contexts to clearly reveal their figurative meanings. This is not interpretation. This is corroboration. This is Bible study that unlocks Bible meaning. This passage indicates God causing the flood… Some might conclude God is the cause of this destruction, that He caused this darkness before creation. That is far from the truth. In our day and age of laissez-faire (literally let do with the idea of don’t intervene … what will be, will be) some would blame God for this mess rather than the real culprit. This is, at the same time, a very hot and delicate debate. The whole concept of laissez-faire is generally applied to economics but goes way deeper into every aspect of living. On one hand you have free will. On the other you have confusion or law and order. In the middle you have those responsible for maintaining stability. The question is: When free will runs wild and goes so far as to lead to chaos, at what point do those with responsibility intervene to maintain and establish law and order. And, importantly, what and how much force can they use for such an intervention? This equation sums up what it means to rule with justice. The above paragraph is the dilemma not only of governments but of each and every one of us in our daily life decisions for those for whom we have a responsibility. That this downsliding into its own character assassination leads to wanting to take over the very throne of the real leader. The leader is then obliged to intervene and put a stop to this rebellion and re-establish calm and quiet. The result of such an intervention does cause upheaval, suffering and devastation. Ultimately the cause of all these misgivings is the Cherub now turned Serpent. For now I think we’ve addressed this issue enough by this point… what do you thing? Please understand what I’m NOT saying or implying here: Every misgiving is NOT the cause of wrongdoing or rebellion… read Luke 13.4. This refers to a specific case: The Cherub and its darkness before creation. However, we’ll talk about the vicissitudes of behavior next week.